There’s been a lot of Internet talk lately on the subject of women in film. Rather, there is long-term discussion about how there aren’t enough great roles for women, or there aren’t enough movies starring women, and so on. I had originally planned a long post on this subject, but the more I thought about it and looked into it, I decided I really didn’t have that much to say. Are women underrepresented and undervalued in movies? Very probably. But who is responsible for that? Bigwig producers? Movie moguls? Screenwriters, or directors? Nope. It’s us. Society is at fault, for a variety of reasons. We place more value on a woman’s looks than on her intelligence or strength. We hold women to a very different standard than we do men. Films about women are somehow more demographic-specific as well, which again points to society’s focus. While women will often go and see movies about men, it is less common for men to want to watch movies about women. That seems to me to be the crux of the problem: we don’t pay to see movies that focus on women. There are actually plenty of movies out there that feature and focus on female characters, but I think that if you looked at box office numbers, you’d find that they simply don’t match up with their male-centric counterparts. And so, my bottom line is that we can complain all we want, but if we don’t put our money where our mouths are, we can’t expect change. Am I suggesting we all should have gone to the theater and seen The Heat, this summer’s lone representative of women in movies? Not necessarily, but that’s part of my point. As audiences, we are simply more excited to see a movie in which Bruce Willis beats someone up than one in which Julia Roberts has a mid-life crisis. I’m not excusing myself from that, necessarily (although I did go see Eat Pray Love in the theater); I’m merely pointing it out. Hollywood makes movies that they think will make lots of money. If we, as consumers, are not displaying an interest in a certain type of movie, it will therefore not make money, and ultimately, studios will not want to make more of a similar type of movie. Having said all that, I’d now like to shift gears, and look at a couple of older, “classic” movies that do feature women. One is perhaps the uber-romantic comedy, in which the heroine stands equal to her hero; in the other, while men are a constant subject of conversation, there is actually not a single one to be found onscreen. I’ll just point out that the latter, The Women, was actually remade a few years ago. It turned a modest profit. Do you ever sit down to watch a movie that’s wildly successful and worry that you won’t appreciate it? It’s critically acclaimed, say, and it won a bunch of awards, and you’re afraid that you just won’t get it? I’ve felt that way about a lot of things; some of the time I’m right, and sometimes, a movie (or a performer: Chaplin, for instance) is really as great as advertised, and you don’t have to be anyone special to understand. It Happened One Night is such a movie. It’s a screwball, romantic comedy, yet it was the first film to win all four of the major Academy Awards (Picture, Director, Actor, Actress). [Trivia time: name the other two!] 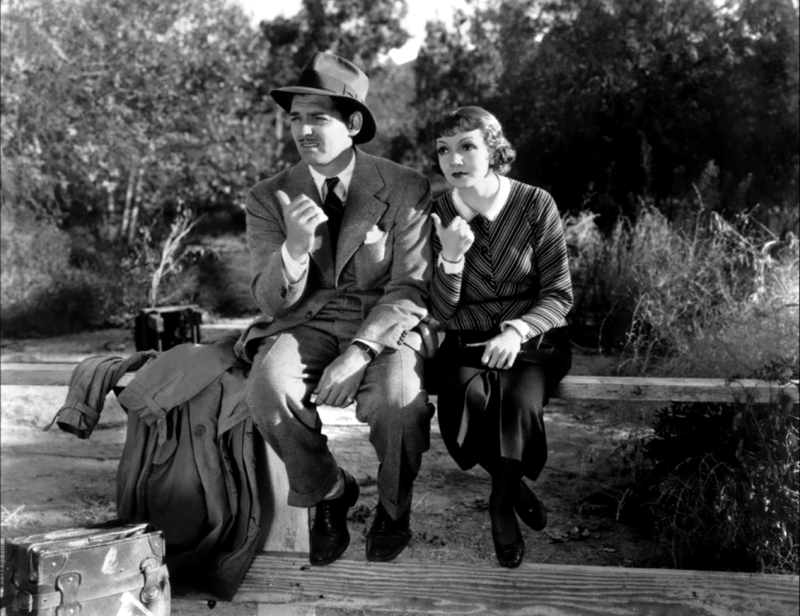 It was directed by Frank Capra, and stars Claudette Colbert and Clark Gable. And it is absolutely hilarious. Ellie Andrews (Colbert) has just married aviator King Westley (Jameson Thomas) against the wishes of her father (Walter Connolly), who in turn essentially kidnaps her and holds her hostage on his yacht in order to talk her out of the marriage. Determined to have her own way, Ellie literally jumps ship somewhere off the coast of Florida and attempts to make the journey back to her husband in New York. Along the way, she encounters out-of-work reporter Peter Warne (Gable), who blackmails her into letting him assist her in return for a scoop. Naturally, they both get more than they bargained for. As a strictly amateur “student” of film, I found It Happened One Night to be a fascinating, and highly entertaining, movie. It has the smart and snappy dialogue of later comedies like His Girl Friday, but the characters are more developed and nuanced than is often the case. It’s beautifully shot, with wide angles and impeccable detail. Claudette Colbert plays a real heroine: while Ellie Andrews appears, at first glance, to be nothing more than a clueless rich girl, she is also gutsy, clever, and independent. She’s hounded by her father and by Warne (her husband is pretty much a non-entity), but she gives as good as she gets much of the time, and ultimately she is an equal partner in her life’s story, rather than a passive commodity. Knowing nothing of Clark Gable beyond Gone with the Wind, I was surprised to find him genuinely funny and likeable. He obviously made a career out of playing the gruff type, but Peter Warne is a lot more than he initially seems to be. In the case of both characters, lesser performers would not have proven to the audience that here are two people worth falling in love with who belong together. That’s often a tall order for a romantic comedy, but It Happened One Night proves itself to be something beyond a standard rom-com, although I’m not sure what we should call it. It’s strong in both the comedic and the romantic aspects, and that’s what makes it a great film, all around. Based upon a successful stage play by Clare Booth Luce, The Women focuses on the lives of various Manhattan socialites. While their relationships with men are a central subject, it is the relationships between the women that are really in the spotlight. Additionally, the story looks at various stereotypes of women, from the homemaker to the homewrecker. It’s a pretty skewering satire of society and relationships that, surprisingly, isn’t all that complimentary to women, despite their being the focus. George Cukor directs an excellent cast here. Norma Shearer plays Mary, who seemingly has the perfect life but whose husband is actually seeing shopgirl Crystal Allen (Joan Crawford) on the side. Mary’s friend Sylvia (Rosalind Russell) loves to gossip about (and add to) everyone else’s troubles, Peggy (Joan Fontaine) is struggling to find a balance in her relationship, and all of this is under the microscope of the society papers. All of the performances are excellent, with each actress fully committing to her role, even as many of them serve to negatively stereotype women. In terms of the look of the film, I was particularly struck with the opening sequences, which take the viewer through a day spa where the women seem to spend their day in beautifying themselves and gossiping about their neighbors. Naturally, the costuming is excellent, and in fact, there’s a full-on fashion show about halfway through. Ultimately, I found the film to be somewhat inconsistent, although I can’t pinpoint anything specific that gives that impression. It is less a comedy than one expects, and more a true satire. While there are some “good” characters, it’s really every woman for herself, and it’s fascinating to see how allegiances and relationships change. Despite a somewhat happy ending, The Women doesn’t pull any punches, and that’s a rare thing. For the most part, things are messier at the end than in the beginning, and perhaps that colors one’s overall perception of the film.